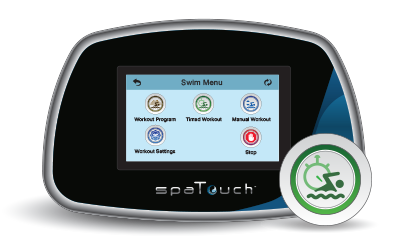 Balboa Water Group is proud to introduce the SmartSwim™ spa control. This newest offering is the result of our never ending pursuit to serve our customers needs. SmartSwim™ controls utilize the same technology that made Balboa Water Group an industry leader. Our unique plumbing configuration ensures uniform water flow for a smooth workout experience. SmartSwim™ can be configured with two, three and four pumps. Balboa's Ultimax XL pumps are an excellent choice for swim spa applications. A wide variety of workout modes ensure swimmers achieve their fitness goals. The swimmer's experience is enhanced by several topside panels that provide quick and easy control. Have a strict exercise regime? you reach your fitness goals.